The situation of Colmar, in the center of the Alsatian vineyards, earned him the nickname of the capital of Alsace wines. Crossroads between Switzerland and Germany, Colmar has tourist assets which have granted him international fame. Its Christmas markets, its wine fair, museums, winstubs, its architectural and historical wealth of Colmar are the favorite destination of tourists. We want you to enjoy our cottage to embellish your best discovery of the treasures of Alsace. Our cottage is situated in the center of Colmar, in a quiet street adjacent to the pedestrian streets. The duplex apartment is on the 2nd floor of an old house with a separate entrance which makes it very quiet. We completely renovated to offer modern services and qualities. With 85m2 of floor space, you have a large bedroom, a large living room, toilet and a very functional modern kitchen. As is the garage (lower vehicles 4. 40m long. Ex Golf, Megane, Giulietta, Focus, 308, Ds ...) Independent located below the apartment with access from the inside. Everything is designed to make you feel at home! Note: our second house "Aux keys Colmar" located 200 meters can accommodate you if this one is already booked! Patrick was a great host. The place was wonderful - neat , clean, and great location. The garage was fantastic. Nous avons passé un excellent séjour. Patrick est un hôte très accueillant et disponible. L'appartement est conforme aux photos, décoré avec beaucoup de goût et idéalement situé !! Le garage est une vraie valeur ajoutée ! Casa molto accogliente nel pieno centro di Colmar vicinissima ai mercatini di Natale. We stayed 4 nights in this nice and clean apartment. Everything was new and clean and the kitchen had everything we needed. The free wifi ws really good. 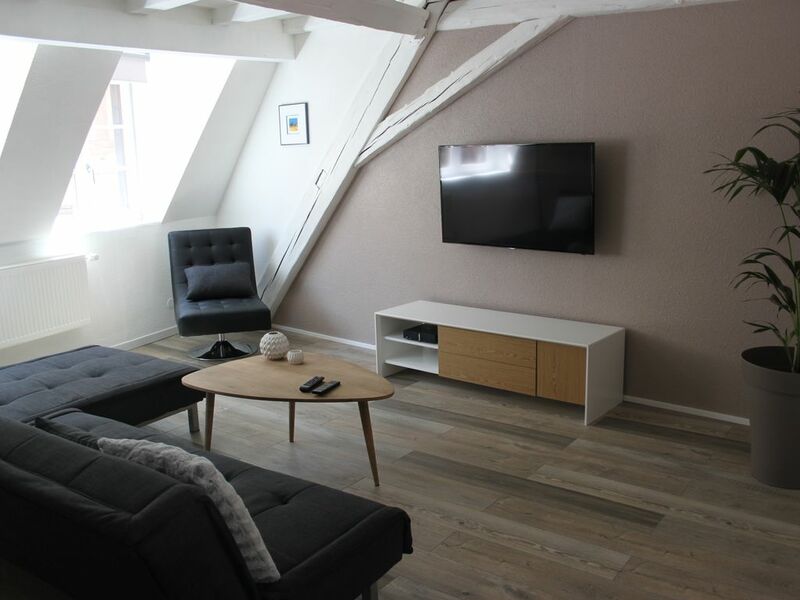 Patrick had a lot of information about Colmar and this apartment is located in the middle of the centre of Colmar. Most of the France people don't speak a lot of English but Patrick was really good. I will definitely come back in a couple of years to relax in the apartment and explore more in the Alsace. Alles vorhanden, was das Urlauberherz begehrt, sogar eine Garage. Das Haus ist mit offenliegenden Balken super schön renoviert und modern ausgestattet. Der Vermieter was echt nett und hat uns am Ankunfts-Abend (wir konnten erst spät anreisen) sogar noch zum Restaurant gefahren. Das Domizil ist wirklich zu empfehlen. Nur ein kleines Detail hat uns gestört, das offene Bad mit der Toilette, also ohne eine Tür zum schließen. Top Zustand der Wohnung sehr sauber, alles ist neu, es fehlt nichts in der Küche. Sehr gemütlich und geschmackvoll eingerichtet. Super Zentral mitten in Colmar, doch sehr ruhig. Bäcker und Fußgängerzone vor der Haustür. Der Inhaber Patrick und die Eltern sind ganz nette Gastgeber. Wir haben uns sehr wohl gefühlt und empfehlen es weiter. ( Paar Anregungen: Tür im Badezimmer. Spiegel am Eingang. HandSeife im Badezimmer.